Today I am going to tell you a little bit about my dog Bosco. 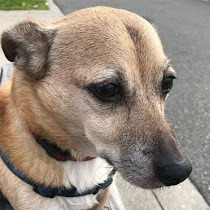 Five years ago we rescued my dog Bosco who is a corgi and dachshund mix from a house in Jersey City, New Jersey from a women who is a foster parent to cats and dogs. We found a picture and description of our dog on Petfinder and we thought he looked so cute. Well we went to go pick him up and he was running all over the foster house and all over our car and we were happy to get him to our house. When we got Bosco his name was Short Stop and I said to my self that his name did not flow nice. We all thought and thought and then I came up with the name Bosco because when we were little my mom made us chocolate milk and it was called Bosco. My dog is so sweet and friendly and loves people and other dogs and the name fits him perfect. I also think that the reason why he is so friendly is that he was adopted by someone and then returned. When we got him he was very sick and we had to take him to the vet to get him better and I think that if he had stayed at that house he might have died. When we got Bosco he was only 7 months old and he used to jump a lot and nip at your hands and pants. Well our dog has turned out to be the best dog. He listens to everything you tell him to do and he loves his walks, he loves to cuddle, and loves taking rides in the car. 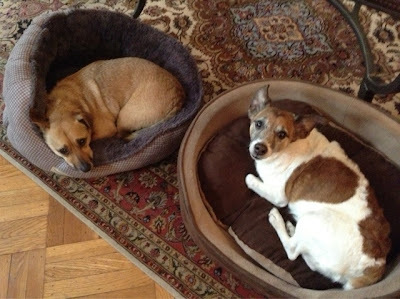 We have a neighbor who has a dog named Scout who is a jack russell terrier and I am pet sitting Scout for 4 days. Scout just arrived this morning and we will watch him while my neighbors go on vacation. The funny thing about Scout is that he does not get along other dogs but he likes our dog and I have found that out because when you walk them both together Scout will sometimes bark at other dogs he sees. Well my house is going to be a little chaotic but we love Scout and both dogs play so nice together and our neighbors watch Bosco when we go away. He will be staying with us until late Sunday night and we will all have a lot of fun with Scout. Here are some pictures of the dogs together. 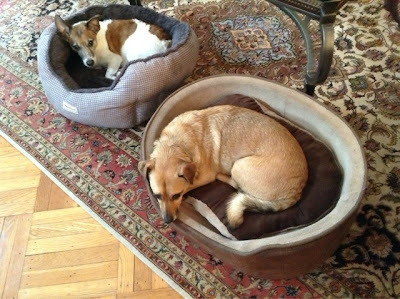 Scout is on the left in his bed and Bosco (my dog) is on the right in his bed. This is a few minutes later after they decided to switch beds!